It feels as though I’ve been here all summer, but in July there were only five nights in my home following the signing at the notario, then just ten nights in August, and a couple of weeks in September. And on those previous visits, I’d managed to miss Market Day. This was primarily for two reasons. One – I didn’t know what day it was on, and two – I didn’t know where it was held. Wandering round one pleasant Thursday morning, I spotted the giveaway sign of a stall with an unfeasible number of Spanish dresses wafting in the breeze, half desperately plain in brown or black, the other half impossibly brightly patterned in an unpleasantly clingy fabric. The street with the market is like Dr Who’s TARDIS. It’s only a short walk up the parallel street, but then returning down this one between the stalls, it goes on forever, at least four times as long as the next street. All sorts of shops are open – or are they just people’s garages? Shops I’d never seen before, really useful shops to which I want to return but I’m afraid they may only exist on a Thursday, morphing back into a quiet residential street for the rest of the week. A number of purchases are made. A bigger bucket for the brick-making, secateurs for the plants, a Spanish flag for the back of the car, an excellent melon, two ripe avocados and a walking stick in case of wandering guard-dogs on my walks in the campo. Nothing over a few euros. Decided against the dresses. 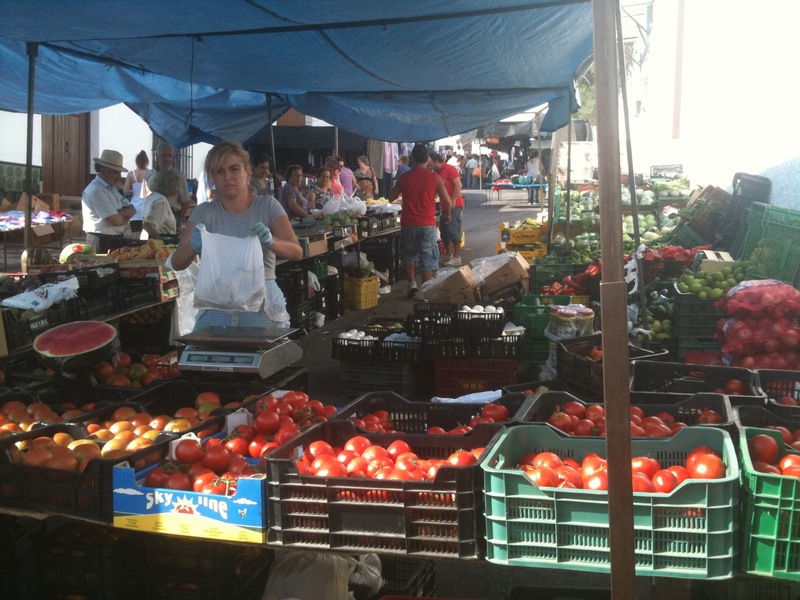 This entry was posted in Spain and tagged Andalucia, Axarquía, Colmenar, market, Spain, SpanishBlog, Tamara Essex by tamaraessex. Bookmark the permalink. Next Thursday go for the dresses – help you blend in with the locals!